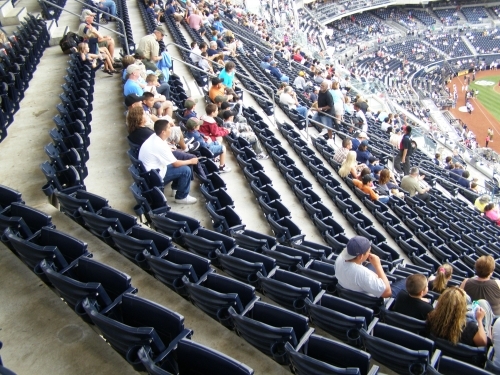 Angling the seats down the lines with a combination of bowl geometry and reoriented seating is a priority in new modern ballparks. All seats should be pointed toward the infield. Generally, there are two ways of doing this. Most of the new ballparks employ a system where the stands from home to just past first/third base run parallel or at a slight angle, while the stands past that point to the foul poles are sharply oriented back toward home plate. Most orient the individual seats toward the infield in some fashion, while some simply reorient an entire section alone. Other ballparks are able to use a curvilinear design, but still orient the seats toward the action. 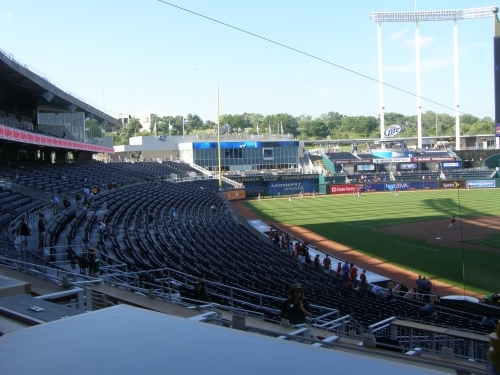 Kauffman Stadium and Angel Stadium, for example, curve around home plate and then curve at a larger radius down the lines, thus pointing the seats by the foul poles to home plate. We also see this down the first base line of Minute Maid Park and Great American Ballpark. I’m personally warming up to this modernist school of thought, as many of the HOK (Populous) seating angles are flawed. Curvilinear seating geometry at Kauffman Stadium. Generally though, this will lead to good enough sightlines, but angled seating/sections is more ideal in the industry. The only supposed drawback, from what I have read but not experienced, is that individually angling seats can create some awkward foot room if you are in between someone. 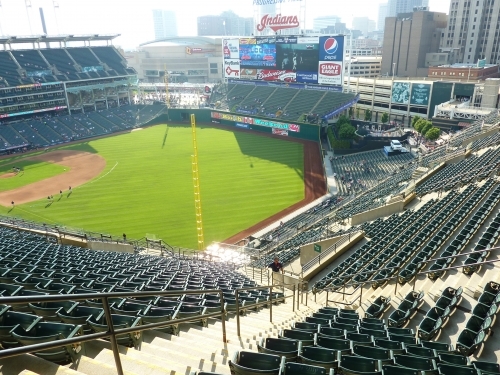 Flawed seating geometry at Progressive Field. One section points past center field, nowhere near the infield. This isn’t a source of controversy, but it’s notable because a number of modern ballparks messed this up in the early days. Camden Yards, and especially Jacobs Field, somehow had significant sightline flaws down the lines, leading to many stiff necks. Its successors in the second retro wave generally did a much better job, but there were still sections down the line that weren’t oriented as well as possible. It’s remarkable that so many ballparks didn’t do this simple task perfectly. Chase Field is supposedly the first to truly angle each individual seat towards home plate at a sufficiently aggressive degree, which I applaud. It is a mystery to me that most ballparks, even those later in the 2000s, do so with reservations. Only a few, specifically Citizens Bank Park and Petco Park, continue to do an excellent job.